Ollie asked to do some science experiments yesterday. In addition to doing some experiments that I've given details of in older posts (such as playing with adding bicarbonate of soda to vinegar, planting beans in a jar and making shaving foam clouds) I thought this new experiment would be good fun. All you need are a cup, a straw, milk and a couple of ingredients to add to it - we used a popular brand of blackcurrant squash and drinking chocolate powder. The idea is to blow bubbles in plain milk and compare the result with what happens if you add different things to the milk. Toby didn't get the idea of blowing bubbles until the third experiment - the plain milk and blackcurrant squash milk both got drunk while he looked confused about why Ollie was getting bubbles and he wasn't. After we cleared up from the blackcurrant phase and got fresh milk with a little drinking chocolate powder added Toby got the hang of it and blew plenty of bubbles for himself. For each phase, you can introduce the basic scientific practice of making predictions and then testing them. Simple questioning like 'we saw that you could blow bubbles in the milk, but they went away really quickly. What do you think might happen if we add blackcurrant squash' gets kids thinking about cause and effect. 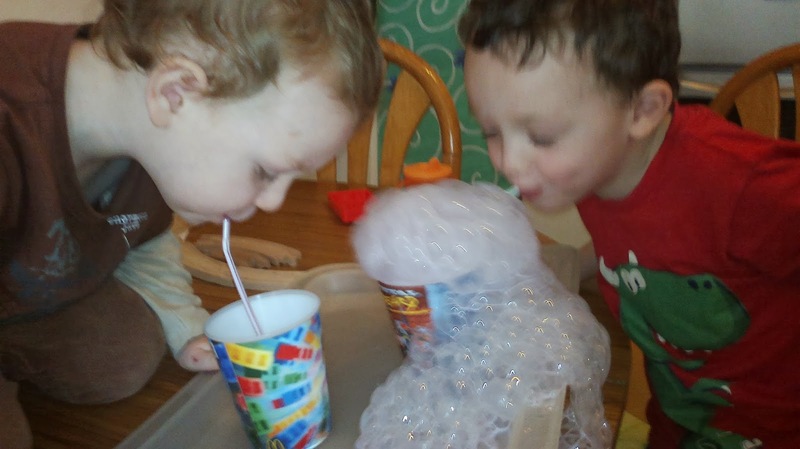 They will start to suggest further experiments you can do adding different ingredients, giving you an opportunity to help them think in terms of practicality and safety - 'yes it would be interesting to see if adding soap will make brilliant bubbles, but do you think your little brother might drink it?' in our case. For really little ones like Toby, it's all about experiencing what happens when you do different things without predicting. Even if they drink every sample, it is just as exciting doing a taste experiment. For slightly older pre-schoolers like Ollie getting used to the idea of making predictions and trying things out is good fun. Ollie enjoyed adding a picture to his science notebook of all the bubbles coming out of his cup. Keeping a little journal of experiments is a good way to play at being a scientist keeping notes and you can encourage detailed observation skills by getting children to draw what equipment they used and what happened. Initially you can write down their description, trying to use their words and drawing them into thinking about what you did together. As they get older they will be able to take over on labelling their diagrams and eventually writing it all, which you may want to support by using a writing frame. These are really simple to make - just draw boxes on a page and give each one a heading e.g. 'What we used', 'what I thought would happen' and 'picture of what happened' initially. Kids who are struggling or not ready for writing can draw diagrams under each heading which you could label for them. For older children, you could use this as a part of an investigation into bubbles generally, describing concepts such as surface tension and air pressure and how certain substances such as soap affect the surface tension of water. The Massachusetts Institute of Technology has a nice detailed page with videos for older kids or for your own interest. Health and safety bit: as usual, apply common sense. You know best your own child's development stage and ability - if you think they're going to stick it straight up their nose, don't give them a straw. I haven't tried this with dairy alternatives, but that would be an interesting experiment in itself. I used blackcurrant squash and drinking chocolate in very small amounts, but because they're both high in sugar I wouldn't recommend adding them to your kids milk as a regular thing. You can get sugar free versions but I suspect feeding sweeteners containing known carcinogens to our children is something that as a population we're going to look back on in the future with horror.